This morning — May First — out of the blue — our five-year-old son woke up and saw fairies everywhere. Everywhere. He was ecstatic, sitting in bed, watching the tiny things dancing on his blankets, dancing on his pajamas, dancing on his sisters’ heads. He laughed and laughed and laughed! He saw them at school, he saw them on the playground, he saw them at the dinner table… He whispered his secret into his best friend’s ear. “That’s so awesome!” said his friend. At dinner all the kids put a bit of their food into a bowl for the fairies. Esmerelda’s weather witching this year has apparently led to a striking result. Look at this map, which shows temperatures for the month of March this year, alongside an in-depth look at the El Nino and La Nina phenomena. Notice in particular that while March 2008 was the second-warmest March ever (beat only by March 2002), and Europe and Asia in particular suffered amazingly high temperatures, North America (where Esmerelda focused her efforts) was pretty much dead-on average — even slightly cooler than average in eastern Canada. Speaking of weather magic: since we’re deep into 2008 now, it makes no sense to keep offering the 2008 Almanac at full price. It’s now available at 50% off: $9.99 for the print version, $7.00 for the download. Happy Beltane! For the Word of the Day, I put up an analysis of the name Barack Hussein Obama, which was hugely fun to do and uncovered a lot of surprises about the names — and surprises about the man, as well. For DJ Meditation, I posted a description of one of my daily visualization meditations — no analysis, no rumination, just what I experienced. See what meaning you can draw from it. This winter I’ve been working on a major project for DJ Meditation, which I hope to unveil very soon. Stay tuned, true believers! Oh, the green grass and the blooming trees! What greater joy?? What does a druid do on the winter solstice? That depends on the druid. If you’re a Reconstructionist, you don’t do much. There isn’t a whole lot of evidence that the ancient druids did anything to celebrate the two solstices and equinoxes; their high holy days were the four cross-quarter holidays (Imbolc, Beltane, Lughnasadh, and Samhain). The solstices and equinoxes aren’t even marked in the Coligny calendar, for example, while there is evidence there for Samhain, Lughnasadh, and Beltane. If you’re a Revivalist, you celebrate Alban Arthuan, the festival to honor King Arthur and the return of the light. 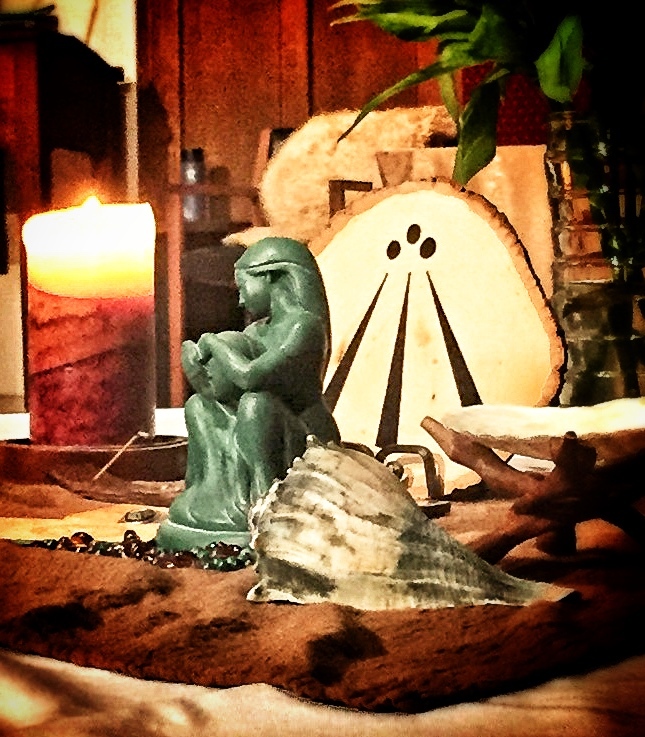 Druids commonly gather in a sacred space and watch for the sun to rise, greeting it with the powerful “Awen” chant, and honoring it with ceremony. However, the Revivalists are not dogmatic, and traditions vary widely among them. I have called myself Reconstructionist on this site several times, but honestly I’m not quite sure about that. This Lughnasadh has been a quiet one for our family, but one with some very interesting revelations for me personally. Our usual mentor, Ellen Hopman, was away in Tennessee leading a large gathering, so the six of us tramped into the woods to do our own little thing. It turns out that back behind the farm where we get our summer vegetables is a stand of woods with a network of crisscrossing paths, and a lovely little brook with bridges scattered here and there along it. It was amazing to us what a sense of peace and reverence permeated these quiet woods, even though they are almost completely surrounded by developments now. At one of these bridges we sang “We are Children of the Earth” and silvered the water; then we went to the top of a hill and gave our offerings to the trees and to fire. I read a selection from the life of Lugh — the part where he’s taken from his home on earth and raised up to be a man by the King of the Sea, and how he decides to return to Ireland and free it from the yoke of the Fomorian invaders. Then we did a brief divination using Druid Animal Oracle cards, asking for guidance in our search for a home closer to the land. The general indication was that the search will take considerable cleverness and a strong warrior spirit, but that we will have help. Then we tramped back to the farm proper and had a feast of whole wheat and oat rolls and salad. We placed a roll at the base of a birch for the local fairies, as well. Afterwards, most of the kids headed for the sandbox, but our 6-year-old second daughter, who I sometimes think has more intuition about people and relationships than the whole rest of the family put together, sought out the farmers, buttered them up properly, and secured a free cantaloupe and other random fruit. We had a lovely time. Lughnasadh is Old Irish for “Lugh Gathering”, and it was a fire festival celebrated midway between the summer solstice and the fall equinox — a time of gathering together for trade and exchange of goods and ideas. As such, it wasn’t primarily a harvest festival, though according to legend it was established by Lugh, king of the gods, in tribute to his mother Tailtiu, who died readying the fields of Ireland for agriculture. Lugh is the primary syllable of Lughnasadh, and it is similar to the name Luke and Latin lux in sound and meaning: a light, volume-filling energy is gathered with speedy, fluid motion into a grounded container — or, put more simply, embodied, flowing light. It appears that some of my guides arranged matters so that they would be “revealed” at this time of year, when the energy of the sun is made manifest, because they are so closely tied to solar energy. This past spring, an arsonist destroyed the Church’s meeting house. It is now a two-story skeleton of blackened bones, wrapped round with a single yellow caution strip, as if that were the only thing holding it up. Around it, the forest, lawn and garden are lush with summer growth. Near the top of the hill stands the husk of a tree, struck by lightning. It was also smitten this spring. At the base of the tree, one of the Church’s members cut a crop-circle-like maze in the tall grass with a weed whacker, and placed a salvaged soot-covered statuette in its center. Before the Solstice ceremony, and late into the evening afterwards, the children played games in the maze, and chased lightning bugs. The Nature Church has been purified by fire. The following is a poem attributed to one of the greatest Irish heroes, Fionn Mac Cumhaill, said to have been composed by him shortly after gaining the gift of poetry from the salmon of wisdom. the soft white bog-down grows.